1. Below is an "MP3 player" with an embedded "Track List," featuring all of the songs in this category. The first song is highlighted in a blue banner. Click on it or any other track to play that song. 2. Below the MP3 Player is a list of the songs in the Track List. (See the spinning CDs.) Clicking on a song in the "Song List" takes you to that particular song where you will find lyrics, a brief description and marketing information. 3. Before listening to a particular song, we recommend you click first on that song in the "Song List." Read the "Song Description" and the intended "Target Market/Audience." Then click the small "(Top)" link just to the right of the song name to come back to where you are now. 4. Once you have returned from reading the song description and background information, play the song by clicking on the Track List (within the MP3 Player). Then click the name of that song in the "Song List" once again to read the lyrics while the song is playing. Video — Slow motion video of events going wrong such as getting a bad grade on a test, missing the bus, dropping an ice cream cone, spilling a glass of some liquid and waking up late begins the song. a fender-bender, and so on. . This commercial was designed to inspire people who want to restart their day or take a break to reach for a coke. Another brand can be substituted. When you can't shake feeling lazy. When you think you just might go crazy. Well there's something you should do. Take a break. Grab a Coke. Start new. Start a brand new day. Wash your little troubles all away. Grab a Coke and say, "It's a brand new day!" Video — A very large group of Wal-Mart employees is in the background, though they are out of focus. The speaker takes a step backwards after speaking so that he becomes part of the group as the image of them becomes sharp, and they begin to sing. The group is so large that it is impressive. The holiday season is one time of the year when people are receptive. This message of good wishes from so many Wal-Mart employees will humanize the company, making people feel warmer about the brand. we want to wish you a healthy holiday. And we want you to know that we are proud to be a member of your community. and let us sing for you. It's a happy holiday, and love is in the air. We at Wal-Mart want you to know that we care. It's a happy holiday. The air is filled with cheer. Video — A spokesperson explains that the bank has adopted a policy that is unique in the industry. The bank will never say the word "No" to those who apply for a loan. Rather than say, "No," the bank will counter offer the request based on the application. The result will be more business, and powerful emotional bonds between the bank and applicants. Typically, banks accept or reject an application for a loan. This policy is absurd. Banks advertise at great expense only to turn off prospective customers who have taken the time and have opened their hearts, hoping for the bank to accommodate them. The bank does not need to say, "No." Rather, the bank should counter-offer based on the application. After all, the applicant may have a rich uncle who might make up the difference or who might co-sign for the balance, or the applicant may have other equity not revealed, or the seller may reconsider the terms, and so on. The point is that by saying "No," the bank alienates a potential customer for life. Instead, why not form an unbreakable emotional bond with the prospective customer and win him over (and his family) permanently? and often a family dream. That's why SouthTrust Bank has instituted the "Never say no policy." and we will do everything we can to approve it. we will not deny your application. and then assist you in finding a way to help you turn your dream into reality. Remember, your friends at SouthTrust Bank will never say, "No." When you need a loan, there's only one place to go. At SouthTrust Bank, we never say, "No." Video — A man and woman are chatting over lunch. This song is meant to advertise civic theaters throughout the country. There are two key ideas in this commercial. The first is to get the listener to say the name of the theater and then the sponsoring advertiser by seeing if they can say the words three times fast. This is a powerful way to embed an idea, including a name. The second idea is to cause the listener to believe that the local theater is about them. Woman Bet you can't say, "Civic Theater" three times fast. Hey, what's the Civic Theater about? Woman Well, it's about music, and laughter, and education. It's about children's stories, adult themes, and family entertainment. I guess you can say the Civic Theater is about you. Civic Theater, it's about you. You'll have more fun that you thought you would. And you'll discover something new. Man This message is sponsored by your friends at Holler Chevrolet. Woman Bet you can't say "Holler Chevrolet" three times fast. Video — A woman is walking toward the camera. She leans into a bedroom and says goodnight to the children. Then she speaks to the camera. This song appeals to all women who are in a romantic relationship. It is especially identifiable by women who also experience the responsibilities of work and raising children. woman You gotta be kidding me. I need a little TLC, not a roll-in-the-hay. I draw a warm bath, lather up with Dove, close my eyes, and drift away. You can count on Dove. Woman So when you've had a crazy day, do what I do. Take a mini-vacation with Dove. Video — Cute dog pictures (or video) are used to “warm” the hearts of viewers. This song was written to be a commercial for a manufacturer of pet food or pet medication, etc. In fact, any two-syllable theme can be used in place of "puppy." For example, the word “kitty” or “baby” can be used, making this song applicable to many products and services. he’s like a piece of candy. a puppy can come in handy. One big squeeze (hug pet). just like this (show warm sweet smile). silly songs like this (show warm sweet smile). Video — Video of Lowes Home Improvement Center employees helping customers shop and then cash out. Everyone is helpful and smiling with emphasis on satisfied customers. This song was written for Lowes to compete with the Home Depot theme song that has become popular. And things you need to know. © 2018, Don Magyar. All rights reserved. This website is based on the knowledge and discoveries of Humanology®. Humanology® is the science of understanding human nature. The ramifications of understanding human nature are many. A few examples follows, demonstrating the broad range and power of this breakthrough knowledge.The ramifications of understanding human nature are many. The Patriot Party® is an emerging political party that endorses the application of Gravity Theory and the Bidirectional System as the way to resolve America's social, financial and political problems. Patriot Party Radio broadcasts the Patriot Party® message. Spring-Gravity Theory® is the result of a breakthrough in understanding human nature. Spring-Gravity Theory® is a marketing group that applies the teachings of Humanology® in crafting marketing plans and advertising campaigns for the largest companies and nation-states worldwide. That breakthrough is featured on the Humanology® website. More and more organizations are adopting the knowledge offered by Humanology®. Foundation to Empower Marriage is a non-profit organization dedicated to educate high school seniors on how emotions work and how to use that knowledge to form and maintain successful long term personal relationships including marriage. Foundation to Empower Marriage is a non-profit organization dedicated to educate high school seniors on how emotions work and how to use that knowledge to form and maintain successful long term personal relationships including marriage. It's Not About Love is a musical written for high school and college students. It reveals the secret to success in romance and fulfillment in marriage. It's Not About Love is a musical written for high school and college students. It reveals the secret to success in romance and fulfillment in marriage. It's message is based on the knowledge and discoveries of Humanology®. School Is Cool is a not-for-profit corporation that works with the major sports associations in elevating the value of education in the minds of our children. School Is Cool is a not-for-profit corporation that works with the major sports associations in elevating the value of education in the minds of our children. Fittest Form® is a program that helps people achieve their best physical and mental state. Idea Songs is a group of songwriters that applies Humanology® in crafting songs, with an eye on making the most impact and maximizing audience appeal. Fittest Form® is a program that helps people achieve their best physical and mental state. It was founded on a breakthrough in understanding human nature. That breakthrough is featured on the Humanology® website. Idea Songs is a group of songwriters that applies Humanology® in crafting songs, with an eye on making the most impact and maximizing audience appeal. Professional Songwriter Group is an association of lyricists and composers that study human nature and incorporate that knowledge into their musical works, making their products more impacting on the listening public. Back On Top Music is a publisher of music that works only with authors who understand and incorporate what we now know about human nature. 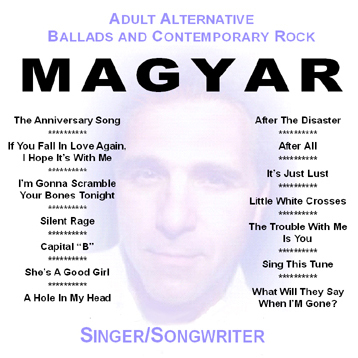 Magyar Music is a music act that incorporates Humanology® when crafting its songs. More and more organizations are adopting the knowledge offered by Humanology®. The author of Humanology®, Don Magyar, can be contacted directly by going to his website. His books are individually titled and can stand alone, yet they are part of the Humanology® series, published by Permanent Publications.